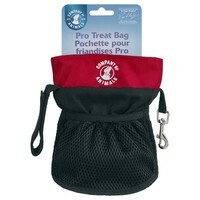 The Company of Animals Pro Treat Bag is the dog trainer's choice when it comes to treat storage. With a magnetic popper and drawstring closure for extra security, this wide opening treat bag makes quickly giving your pet a treat completely hassle free. The bag also features a smart zip fastening pocket on the reverse for extra storage and an elasticated pouch on the front for storing other handy items. Designed with the dog trainer in mind, this generously sized bag that has many sophisticated features makes it stand out among the rest. Very well made, great bag for training. It's quite large though, larger than I expected, and I've got a small dog who has little training treats, they tend to get lost in the lining at the bottom of the pouch. For larger dogs with bigger treats/kibble it would be brilliant.